I’d like to thank everyone who linked up to my 1st linky party last week. It was a huge success! It was so much fun, I’m doing it again! 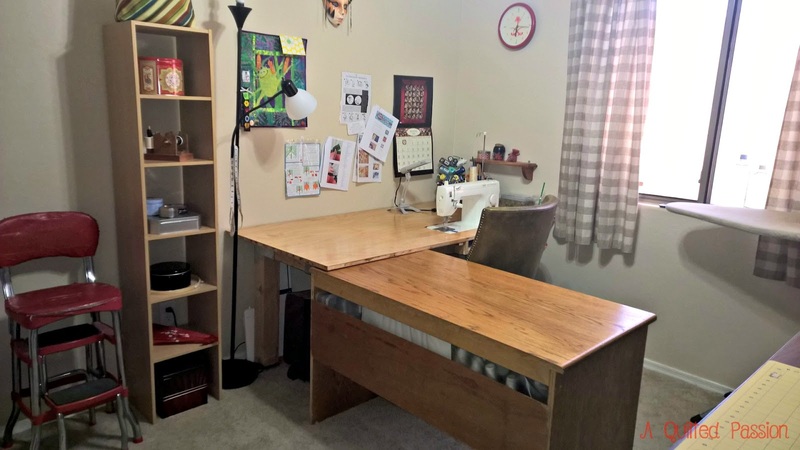 Today I’m sharing some of my recent sewing room improvements. 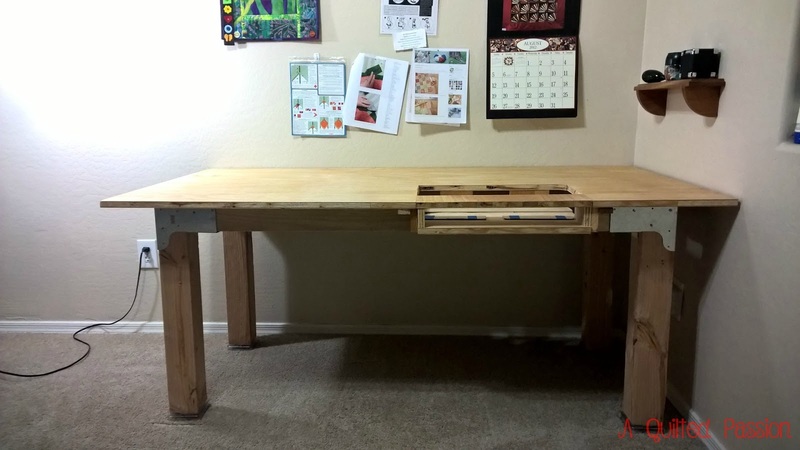 For the longest time I’ve wanted a sewing table that would allow my sewing machine to be flush w/the table top . 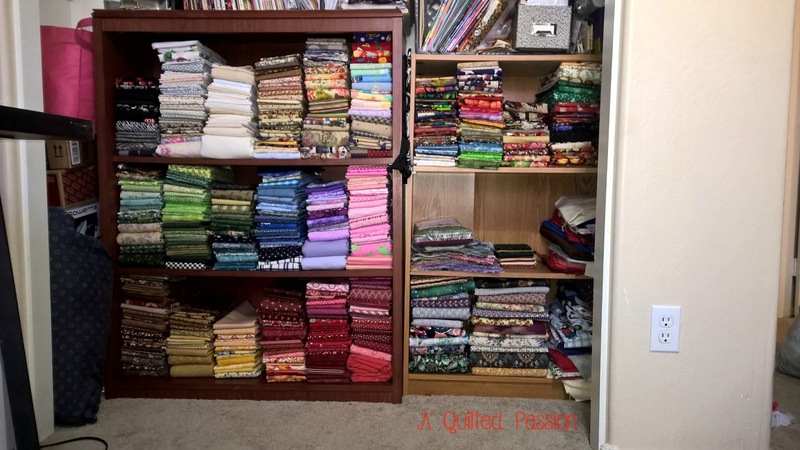 Anything to help make FMQ a little easier. I found a pic on Instagram, gave it to a friend along w/measurements I felt would work for me and he came up w/a building plan. 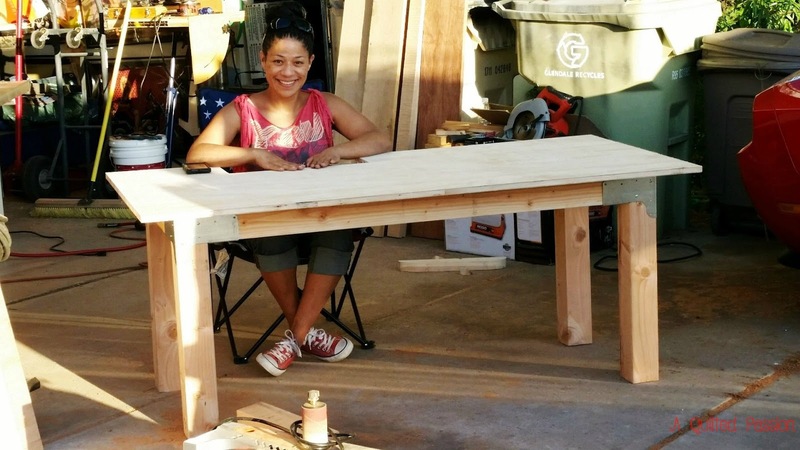 Well…I was off on my measurements and the 1st draft of the table came up a little short…literally! Believe it or not, I didn’t take into consideration that the machine would sit below the top of the table and I could barely fit my legs under it…which was no good considering I’m a big fan of the knee lift. But have no fear, it was a quick fix w/a set of risers. 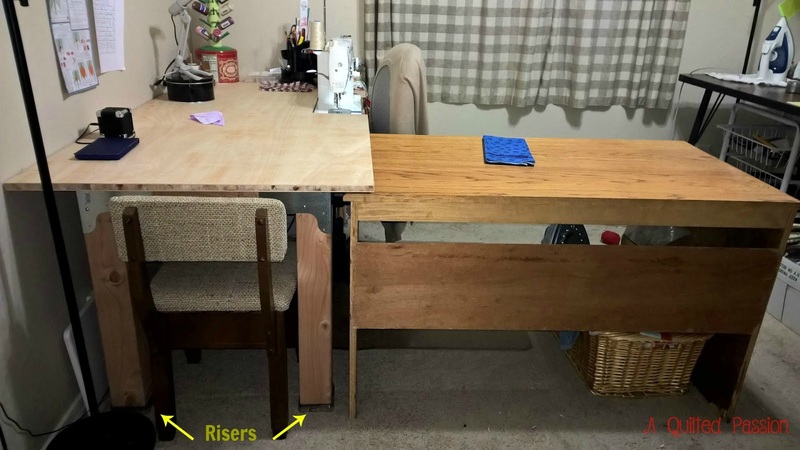 They raised the table 1.25″ which was all it needed. After sewing on it for awhile I decided that I really needed something up front to rest my hands on. Modifications were definitely in order. And a few months later, modifications were made. I did not add longer legs though, I’m still just using the risers. 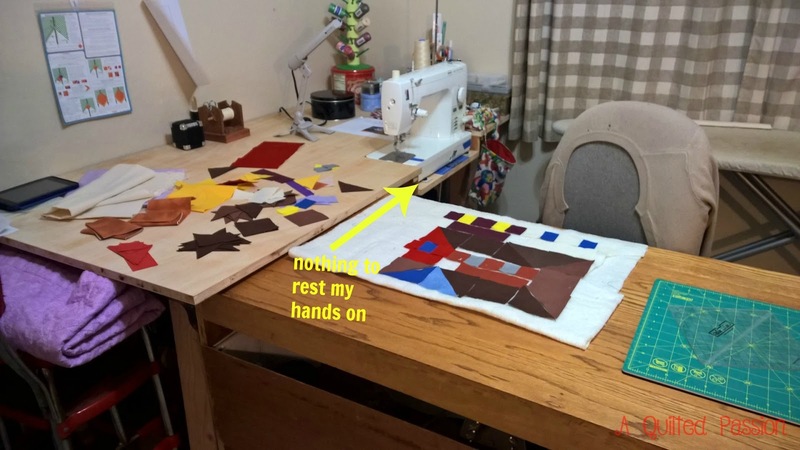 I used my old sewing table as a return which works perfectly for quilting. 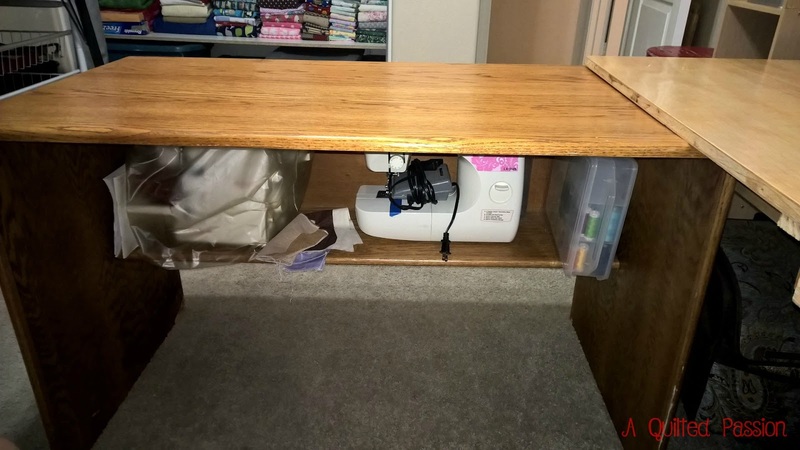 It’s also where I store Oh Susana (my serger), Penelope (my backup and sometimes traveler), and my thread case. I just realized if I turn it around, to where it faces out, I can have a guest sewer in my sewing room! 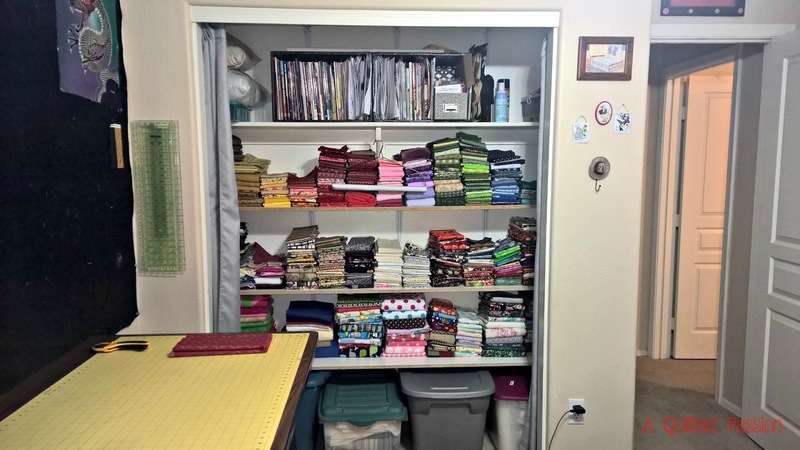 I got rid of the bookshelves in the closet and installed shelves for book and fabric storage. 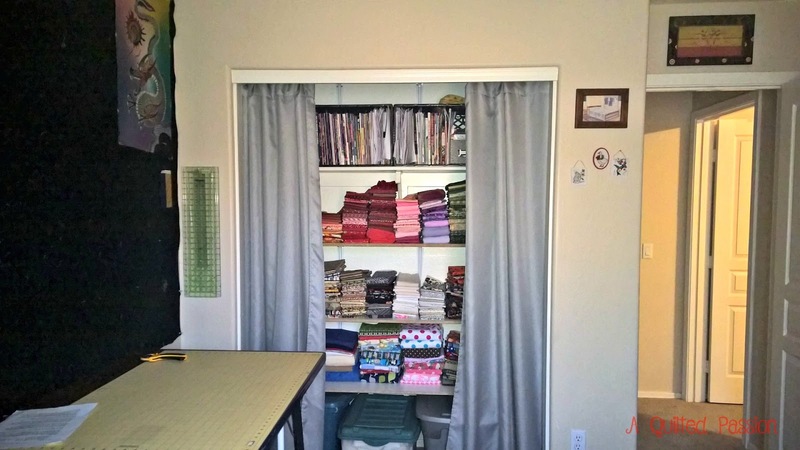 I’ve heard I should protect my fabric stash from dust and sunlight, so I also put up curtains. One of these days I’d like to make cute patchwork curtains. 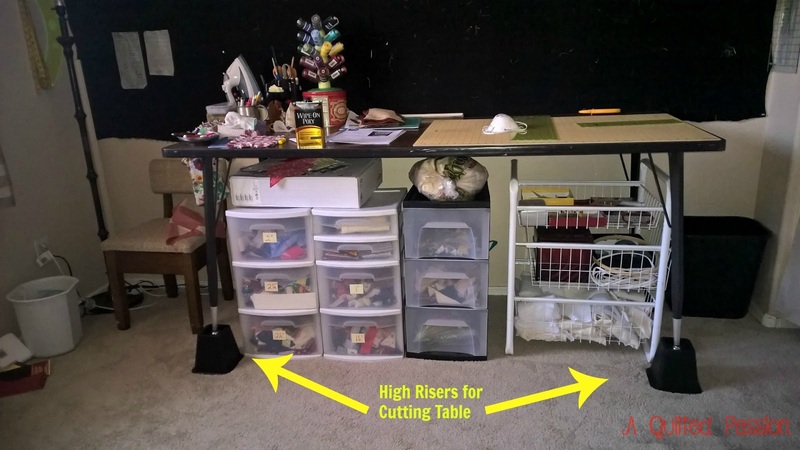 I raised my cutting table w/some high risers I found at Walmart. Now it’s the perfect height. I’ve got some other storage going on under my cutting table too. 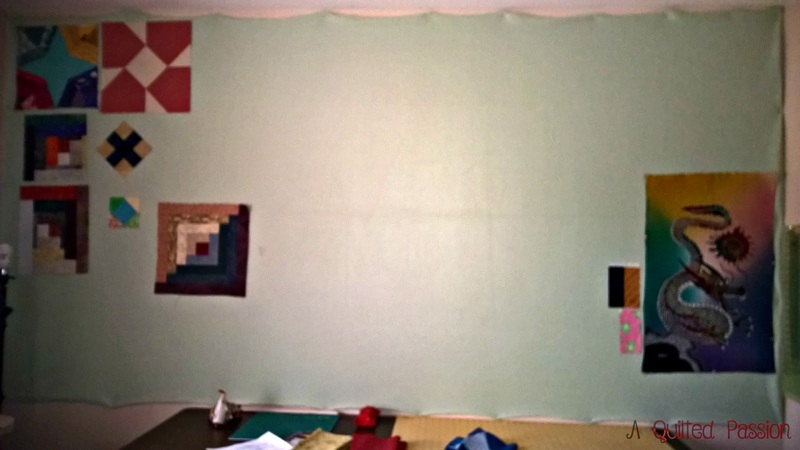 My design wall is a piece of fleece tacked up on the wall. It’s been black since I started quilting 4 years ago, but I wanted the room to be brighter so I traded the black for a pretty mint green. 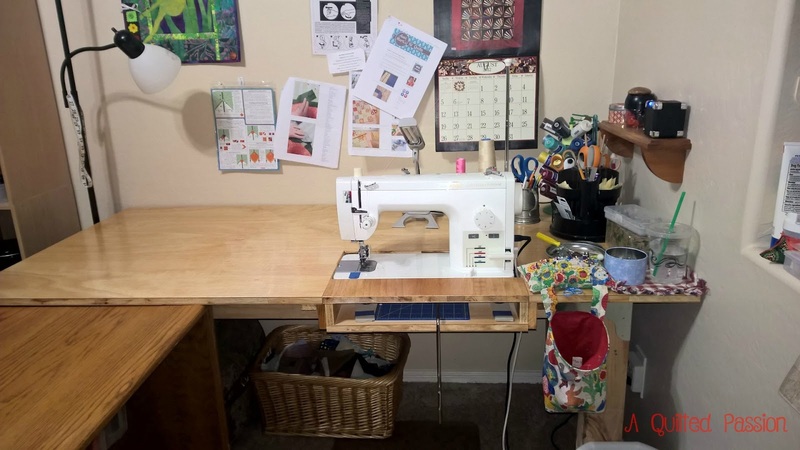 Next on the list of sewing room improvements is a Quilters Ironing Board! Now it’s your turn to share. Link up to my new WHOOMP There IT Is! Saturday Linky Party below.